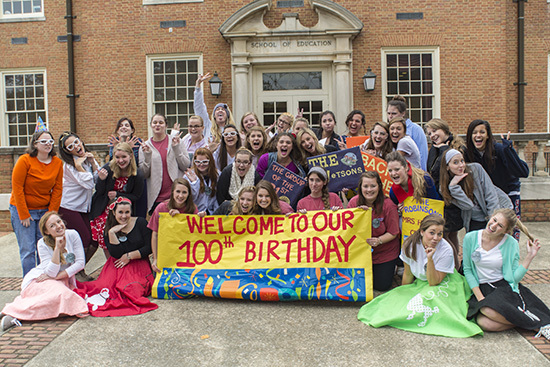 More than 100 second grade students from Trace Crossings Elementary School in Hoover, Alabama, visited Samford University on Nov. 12 to help celebrate the Orlean Bullard Beeson School of Education’s centennial year. The event was hosted by Samford education students. The goal of the day was to celebrate the milestone year with elementary students by teaching them about the history of education in the United States. Students rotated through various classrooms representing different years, including the Samford School of Education’s founding year of 1915, 1955 and a classroom of the future. Students participated in a simulated lesson from each period, learned playground games of the past and attended a 1955 school dance. Students sang, recited poetry, completed arithmetic, made crafts and learned how schooling has changed over the years. Amy Hoaglund, assistant professor of curriculum and instruction, said one particularly special part of the day was when former Samford teacher education professor and lifelong educator Frances Carter spoke to the children about her own teaching experience in the 1940s. Samford teacher education candidates spend significant amounts of time in Trace Crossings classrooms as part of a K-12 school-university partnership. The partnership allows candidates to become immersed in the elementary school culture. The school of education will continue its 100-year anniversary celebration with the Tom and Marla Corts Distinguished Author Series featuring former first lady of the United States Laura Bush on March 26, 2015.